InstaCopy creates the exact copy of the confirmation mail your customer receives. It allows you to form the whole list of recipients: administrator, sales, bookkeeper, logistics etc. This way you get the full control of the customer experience that standard OpenCart admin confirmation just can not provide. In real world after a customer has paid for the product, he receives nice looking shopping bag, which he carries through town, having a good feeling about his purchase. 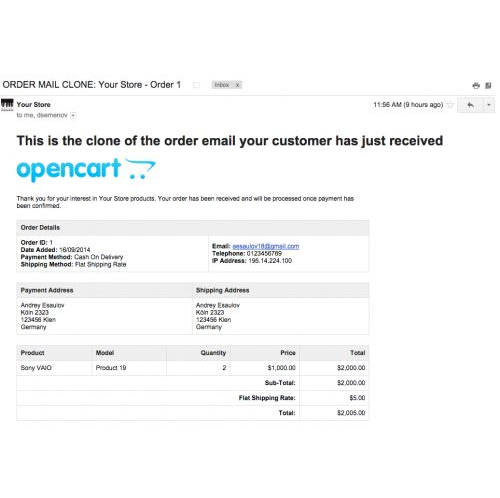 In E-Commerce all the customer gets after he already paid his money — is confirmation mail. That is why it is absolutely critical to leave your customer with the beautiful, compelling, nice formatted and good written confirmation mail. control the tax calculations, the shipping fees etc. In order to use InstaCopy you will need to install vQmod plugin. Go to “Extensions > Modules > Order Mail Clone” and then click [Install]. As soon as you become our customer, you will receive hight quality support. Sever setup, FTP or even Skype call.